Powerful things can emerge when educators and local communities work collaboratively across roles. A decade ago, it appeared the final bell would ring for Seattle’s Rainier Beach High School. Test scores and graduation rates were low. And in a building that opened in 1960 as a junior-senior high school with 1,200 students, enrollment had dropped steadily to barely a third of its original size. By 2008, the predominantly African-American school had landed on the then-superintendent’s list of proposed closures. What happened next, explained Ann Ishimaru, a University of Washington associate professor of education, could have mirrored the story of many struggling schools around the country: a staff housecleaning, a curricular overhaul, maybe even an administrative takeover, all aimed at improving student achievement at an “underperforming” school. Instead, the parents, students and leadership of Rainier Beach upended the usual trajectory, Ishimaru said, embracing the school and making the effort to save it a community undertaking. Ishimaru studied the school’s transformation and published her findings in August in the Journal of Educational Administration. For the paper, Ishimaru pored through documents and data and interviewed students, parents and a variety of school and district staff and administrators. The goal, she explained, was to provide a comprehensive look at how a community collaborated and transformed a school with a focus on social justice. Typically, there is a top-down approach to so-called “turnaround” improvement strategies ­— a federal classification associated with grant money, Ishimaru said. Policies are premised on the notion that dramatic disruption – such as closing a school or firing most of the staff – will improve achievement as measured by test scores. But that approach ignores the racial inequities embedded in the educational system since the beginnings of formal education in the U.S., Ishimaru said. From segregation and property tax-based resource disparities among schools to implicit bias in the classroom, the fundamental structures and routines of public schools tend to disproportionately close opportunities for students of color, particularly in working class communities. . For the most part, the use of turnaround policies, Ishimaru said, has reinforced a narrative that blames students, families and communities for school “failure”—in short, exacerbating racial inequities. 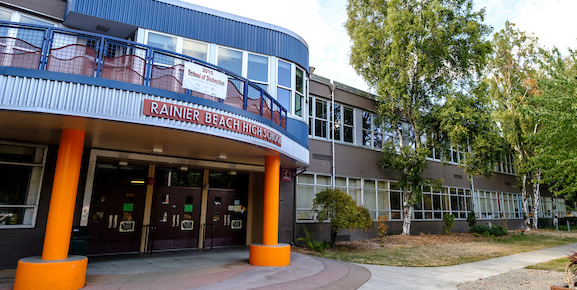 Today, nearly 750 students are enrolled at Rainier Beach, which won a national award for its improvement efforts in 2016. Nearly all 11th-graders takes at least one IB class. And while not every data point is one that traditional reform advocates would tout, one statistic is hard to ignore: In 2017, 89 percent of Rainier Beach students graduated in four years — higher than the school district and state averages. Ultimately, reimagining Rainier Beach was a years-long process, Ishimaru said, but one that offers lessons for other schools. Story by Kim Eckart, UW News.